Delaware Nature Society volunteers manage and monitor about 100 bird nest boxes at the Bucktoe Creek Preserve near Kennett Square, PA. These boxes usually house lots of Eastern Bluebirds, Tree Swallows, and House Wrens, with the occasional Carolina Chickadee and Tufted Titmouse. This year, there are a few boxes that have produced some new, exciting nests. My wife and I check a portion of the boxes, and in one of them, we discovered a White-breasted Nuthatch nest, complete with 5 lightly brown, speckled eggs, and a nest made up of a lot of bark strips and animal hairs. I have never seen a nuthatch nest, so it was really exciting to attract this species into a box. Jill and her husband Jeff manage and monitor the “big boxes”. Last year, they installed about 10 Wood Duck boxes on the property, up and down the Red Clay and Bucktoe Creeks. Lo and behold, last weekend, they discovered the first Wood Duck nest in one of their boxes. All of their hard work paid off, and hopefully they find more Wood Duck nests. A wood duck nest in a nesting box at Bucktoe Creek Preserve. They lay a LOT of eggs! Photo by Jill Kennard. In another one of the “big boxes”, Jeff and Jill made another interesting discovery…an Eastern Screech-owl nest. They had noticed the owls roosting in this box together for some time, but then discovered that they laid eggs, and as of last weekend, now have chicks! The Eastern Screech-owl chicks are visible here. Look for the little white blobs. 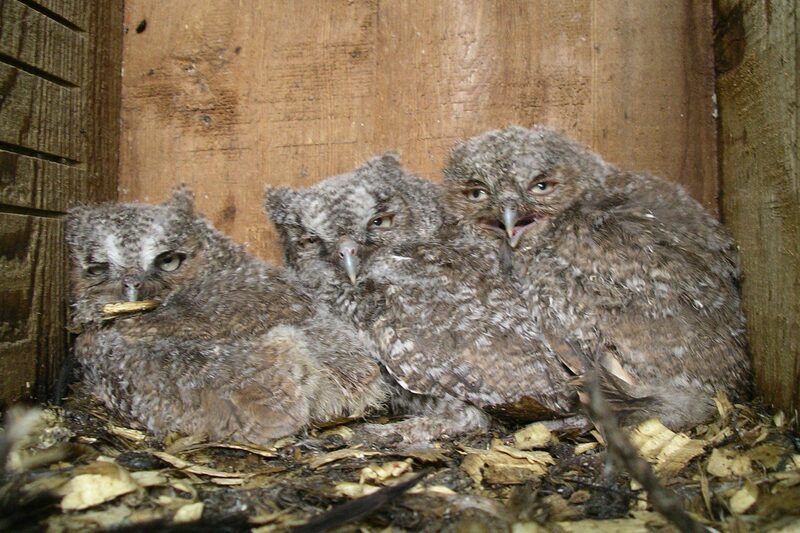 One chick is sleeping on the owl on the right, and another chick is slightly under it. Can you see what the owls have been eating? I see two sparrows, which look like White-throated Sparrows, and I also see an Eastern Bluebird feather. Photo by Jill Kennard. Here are the stats for the Bucktoe bird boxes last year: Eastern Bluebird – 28 nests; Tree Swallow – 25 nests; House Wren – 24 nests; Carolina Chickadee – 3 nests; Tufted Titmouse – 1 nest; Eastern Screech-owl – 1 nest. We will see how many we get this year. 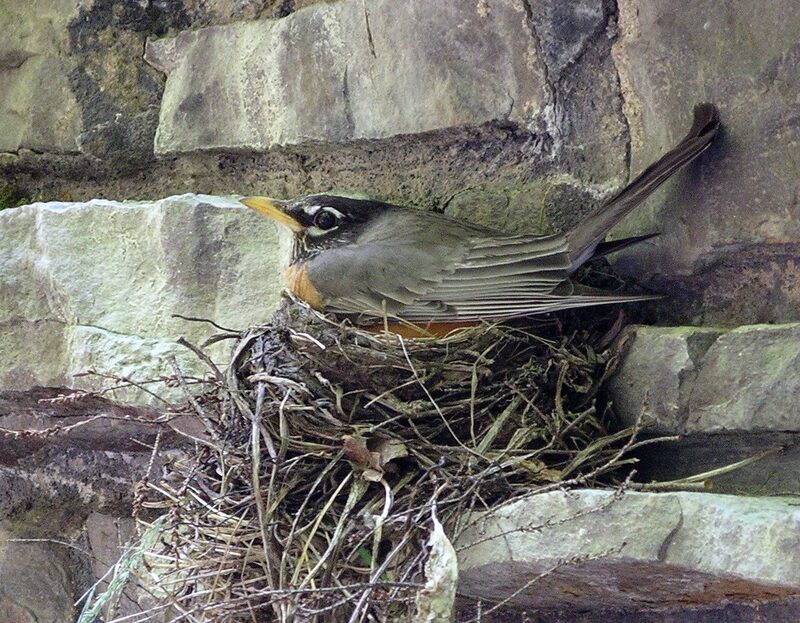 All nest data is being entered into Cornell’s NestWatch program. You can use NestWatch too! 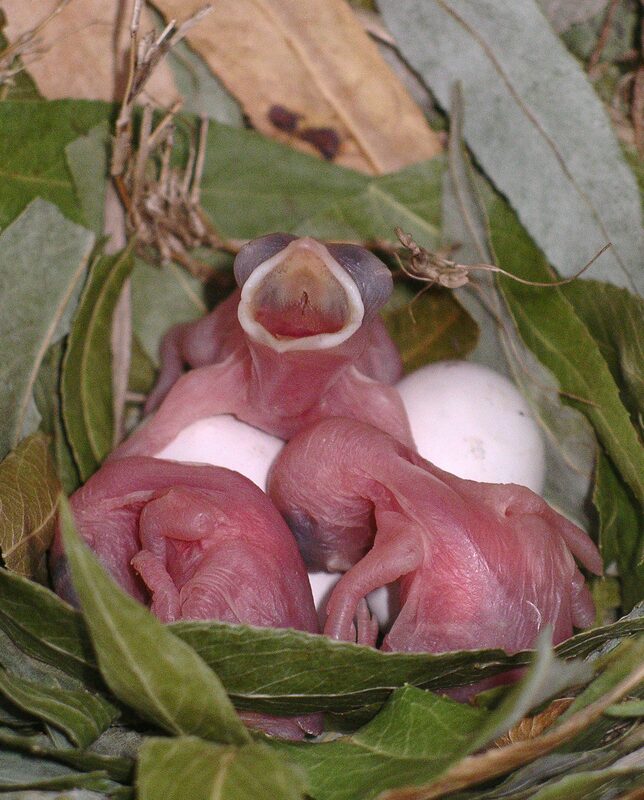 NestWatch is a fun database that allows you to map the nests you find, and report the nest progress, all for science. Check out the website, and start monitoring a nest or two in your backyard! The Delaware Nature Society also has a program in place where volunteers monitor nests on our lands, as well as other private land such as Red Clay Reservation. If you would like to be trained to become a NestWatch volunteer for the Delaware Nature Society, please contact me at joe@delawarenaturesociety.org.